...then I'll begin. Could a government document ever have been a potential contender for the ‘Jackanory’ treatment? Let me explain. Today, 3 January, as part of the transition to a 20-year rule , The National Archives is releasing Prime Minister’s Office records and Cabinet Papers from the year 1984. 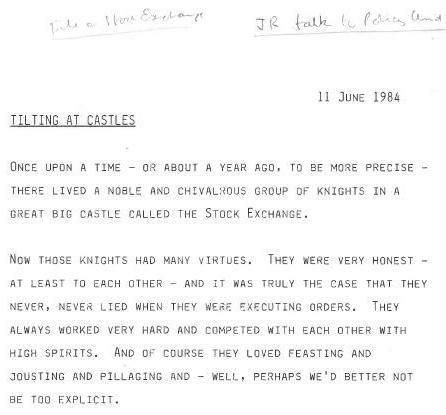 One of the highlights of this release is a very unusual document – the text of a talk given by John Redwood to the Policy Unit at No.10 entitled ‘Tilting at Castles’ in the style of a children’s story about ‘a great big castle called the stock exchange’. In the classic tradition, it begins ‘Once upon a time’. Bemused? I think some more context (back story?) would be helpful. John Redwood was head of the Policy Unit at No 10 from January 1984 until September 1985 and his voice can be found in many of the prime ministerial files released today, repeatedly urging the government to be bolder, and more radical on several different fronts, including welfare and pension reform, the need for significant reductions in public expenditure, and the need for further privatisation. Redwood’s memos are always clearly written – his style is controlled, plain speaking and pithy. He is clearly very influential, and addresses the PM directly. One surmises that he often makes the sort of comment that Margaret Thatcher would have liked to have been able to articulate, if she had not been constrained by political factors. But what was the foundation of this special platform which Redwood used so effectively? The Policy Unit was established by PM Harold Wilson in March 1974. Wilson ’felt that he needed more political and policy advice to counter that from officials’. The key aim of the unit was to provide policy analysis, focused on domestic policy, and it worked directly to the PM. Wilson appointed Bernard Donoughue, a senior lecturer at the London School of Economics, to run the unit – and many would agree with Donoughue’s judgement (in 2005) that ‘we created a Policy Unit which was both an integral part of Whitehall and yet independent of the machine and which, against the odds and under five different Prime Ministers, different political parties and various directors, survived for thirty years’ - and it is still going strong today. Returning to ‘Tilting at Castles’ – what is going here? Is this some whimsical ‘flight of fancy’ by John Redwood? It’s an entertaining read – but he’s making some serious points – essentially, about the need to abolish restrictive practices in the stock exchange, an aim which was realised two years later with the ‘Big Bang’ of October 1986, which revolutionised the City, by allowing foreign brokers and jobbers to be admitted, freeing up the provision of financial services, and ‘allowing London to join fully in the emerging computerised global economy’. So Redwood was using the sugar coating of a children’s story or fable - though admittedly, his targets were thinly veiled - to trail new political ideas which were to come to fruition later on in the Thatcher premiership. John Redwood, MP continues to use the story telling device occasionally in his online Diary. In his ‘happy ending’ of 1984 vintage, the ‘Stock exchange castle’ has been replaced by ‘the Stock exchange market’…’organised like any other market for buying groceries or theatre tickets or even tickets to go and see a good old-fashioned mediaeval joust – just for fun, of course’. You can read the whole story here. This important release of documents also offers new insights into the Government’s handling of the miners’ strike; the shooting of WPC Yvonne Fletcher outside the Libyan People’s Bureau in London; the political impact of the 1984 Brighton bombing; and Mikhail Gorbachev’s first talks with Margaret Thatcher. See The National Archives website for more details. Downing Street Diary: with Harold Wilson in No.10, Bernard Donoughue (Jonathan Cape, 2005), p. 57. Margaret Thatcher: Volume Two: The Iron Lady, John Campbell (Vintage Books, 2008), p. 244. Interesting document. To whom was this actually addressed / sent? Who was the recipient? Thanks for your interest Stuart. It was the text of a talk written by John Redwood intended for the Policy Unit, and my assumption is this talk was duly delivered. I don't think this copy was sent to anyone, as far as I recall from looking through the original file - a judgement must have been made that it was worthy of permanent preservation in an economic policy file - and I'm glad it was!